In my town there is a unique museum: the Musical Instruments Museum, or MIM. Covering two floors of a very large building are hundreds of exhibits, divided up into large cultural groupings (American, Austrian) and within these into musical traditions. In the American section, for example, is an area for Native American dancing, with separate displays for the different tribal traditions. The displays are of musical instruments; many include a video which shows how they are made, played, or their cultural significance. This is not the only such museum in the world, of course. My high school band director collected historical instruments, most of which he could play and would occasionally demonstrate in class. After his death, his collection formed the core of a very fine museum, the Arne B Larson Collection, in Vermillion S.D. But this is not in a class with the MIM. A few months ago some friends came to visit and we went to the MIM one day. Every time I go I get sucked into a few exhibits in particular. This time it was one on Japanese-American taiko drumming, another on Stradivarius violins, and a re-curated one on American popular culture (bluegrass, Johnny Cash, etc). The violin exhibit contained several videos on the superior sound and responsiveness of the Stradivarius instruments with comparative clips. I actually wept, that such things could exist — the music, the instruments, and musicians. The common feature of all these exhibits was the perfection of craft: of the instruments, of their playing, of the music produced. Craft, of course, is a feature of all the arts — indeed, of most human activities.. The fundamental book here is David Pye’s The Nature and Art of Workmanship. And the crucial distinction which Pye makes is between two sorts of workmanship — or what amount to all-encompassing aesthetics, even life-designs. One of these is the workmanship of risk. Without going into this in detail, it concerns processes which inherently cannot be industrialized because they contain an element of uncertainty. Thus often the emphasis of such activities is on the process as much as the product. Musical performance is an example. A de Kooning painting is another. The skills, knowledge, and wisdom to engage in these arts can never be fully mastered. Immense struggle is required. In the end, at the highest levels of ability, we glimpse something important: the immense chasm between mastery and the next level. There is no name for this ability which lies beyond, above. Virtuosity, whatever — nothing quite captures what is nevertheless obvious on first encounter. One stands amazed that such things are possible. All this magnificence is grounded in one thing, the first thing which must be learned: craft. At the simplest level, the knowledge of how to do a thing. There are a great many people who understand some aspect of science. Fewer understand how that knowledge was discovered. Even fewer know how to go about discovering it. And a minute fraction of those know what to look for. At every point, craft is needed if there is to be knowledge. Imagine the craft needed to surpass mere genius. It is one thing to be able to read and criticize a book. It is another thing to write it. What ought to amaze us is the imagination needed to imagine it.. This grounding of art in craft seems to be unknown to most beginning writers. The online writers’ cafés teem with aspirants who are writing a romance novel (“genre” work is usually considered simpler as well as more profitable — one wonders if there is a connection) and who plead for help with such questions as the difference of present from past tense. Apparently, one is first to write, then to sell, and lastly to learn the trade, as if whether the house falls down is the last consideration. As if one were to set out to make a pot and only afterwards begin to wonder what pots are made of. Are these idiots particularly attracted to writing for some reason? Does this contempt for craft have anything to do with the 100-fold increase in self-published books in the last ten years — because we think that anyone can do it? How many of these ignoramuses can be found weeping in a library, overcome by the magnificence of achievement to be found on the shelves and the amazing gift of it all. Gift in the sense of talent, yes. More wonderful, the gift to us of all this. You fools, learn to write something in a mode other than first person present tense. Learn to write about something more than getting laid. Give your life to learning how before you ask what to do. Learn your craft. Tips from self-help books won’t do. Advice from other online wannabes as clueless as you are won’t do. Hiring a guru won’t do, a shoeless wandering beta-reader. How much of your work have you thrown away in the last ten years? All of it? Congratulations. Only ten more years to go. 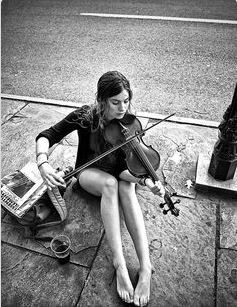 Look on the humble street musician and weep that such grace is possible. I'd like your opinion on this post. Is it the sort of thing you'd like to read more of?